Just a friendly reminder that management will soon start monthly inspections! This means warm weather is coming (YAY!). Inspections are to help keep your community looking nice as well as property values up! We understand that life can be busy and things can be overlooked (especially in the winter months), so please know that we're here to help whenever we can. Should you need clarification on a violation, extension to complete the work or anything else please don't hesitate to email me at tclark@1cbm.com. Attend the next HOA Board meeting on April 10th at 6:00 p.m. at Quarterpath Recreation Center. Homeowners and home renters are welcome at HOA Board meetings! 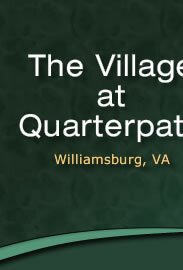 Check out the HOA website for more neighborhood news: www.villageatquarterpath.com. Thank you for being a part of our neighborhood! The next HOA and Board meeting will be conducted on Wednesday, April 10, 2019 at the Quarterpath Recreation Center. The regular session will now begin at 6:00 p.m. See you then! Welcome to The Village At Quarterpath. We encourage all residents to participate in making our Community the best that it can be for all of us. Contact us by using the Contact Us form on this website to find out how you can help. Let us know of your interests and expertise. There is plenty to do. The Village at Quarterpath welcomes your participation. If you have the time and an area of expertise that is helpful to our neighborhood, contact a Board member or Chesapeake Bay Management. Take advantage of the Quarterpath Recreation Center located across the street from our residential area. There is a Walking Club available on Monday - Friday from 8 a.m. until 1 p.m. You may also avail yourself of the "Silver Sneakers" Fitness class, yoga classes, pickle ball, basketball, volleyball, etc. There are pool tables and ping pong tables available for rent. Please visit the Quarterpath Recreation Center's website at: http://williamsburgva.gov/Index.aspx?page=476 for more information. You can also stop by and chat with their friendly staff.